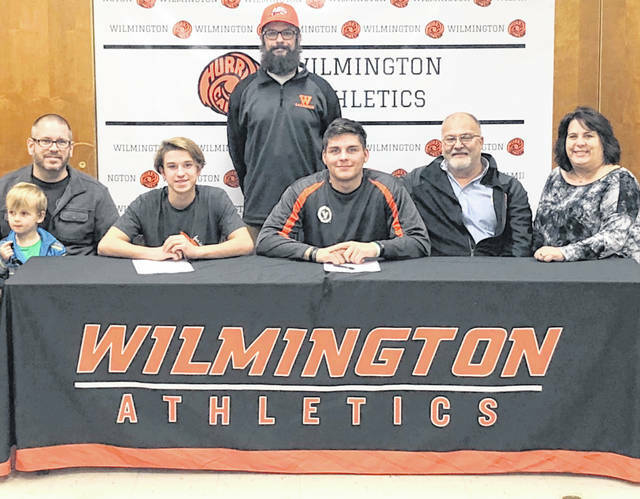 A pair of Wilmington High School lacrosse players have chosen Mount Vernon Nazarene University to continue their athletic and academic careers at the collegiate level. Justus Farris and Bailey McVay selected MVNU. Wilmington coach Adam Shultz said, “Justus and Bailey will be great additions in building a young Cougars program.” In the photo, from left to right, front row, Vincent McVay, Bennett McVay, Bailey McVay, Justus Farris, Ken Farris, Fawn Farris; back row, WHS coach Adam Shultz.